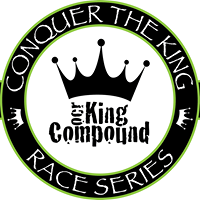 Conquer the King is back for the 3rd installment and will feature a 10k Competitive Heat as well as 5k Open Heats. This race takes place at the permanent OCR training facility known as OCR King Compound in Dallas Georgia. The facility is ever growing and new obstacles are constantly being built so this race is never the same, yet it gets better with every event. Once dubbed as the “Toughest Mile In OCR” it has surely lived up to that title, but we still have friendly options for the new/beginner OCR competitors. We don't know of any upcoming events for Conquer the King. You can check out our list of past events and reviews below, or if you know of an upcoming race, add it to our calendar!